Tissue Processing Cassettes, but with a 30° angle. Sold in dispenser boxes of 500 or cases of 1500. 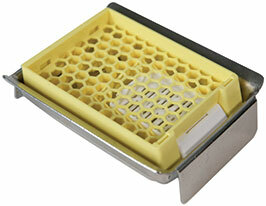 Specially designed for biopsy specimens during the embedding process. 0.9mm square openings to maximize fluid exchange and insure proper drainage. Not suitable for automated printers. 30° angle. Sold in dispenser boxes of 500. Integral lid, large writing area, 45° angle. Suitable for certain types of cassette labeling instruments. Sold in dispenser boxes of 500. 1mm square openings to maximize fluid exchange and to insure proper drainage. Tissue processing cassettes with a large 45° writing area and efficient flow-through slots. Lids and bases are separate. Sold in boxes of 500 (lids and bases). 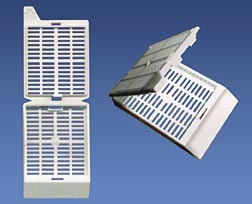 Similar to 27164 series but specially designed to hold biopsy specimens during the embedding process, as well as in a storage cabinet. Large 45° writing area and efficient flow-through slots. 1mm square openings to maximize fluid exchange and to insure proper drainage. Lids and bases are separate. Sold in boxes of 500 (lids and bases). Cassettes keep specimen safely submerged in liquid. Efficient flow-through slots. Snap-latch and hinge-lock design prevent early separation of base and lid and allows for one hand operation. Large labeling area on two sides of cassette. Anterior writing area is at 35° angle. Sold in dispenser boxes of 500. 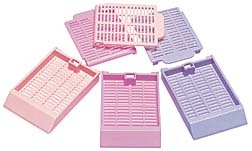 Similar to Unisette Tissue Cassettes. 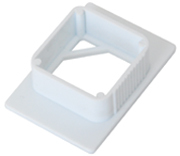 Made of acetal polymer with 1mm openings assure maximum fluid exchange. 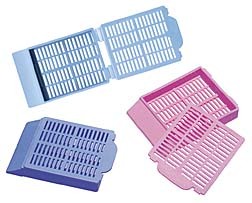 Sold in dispenser boxes of 500. Available in 7 non-cytotoxic, non-metallic colors. 1. Close lid by pivoting it forward. 2. Press front of lid to lock it in place. 3. After processing, remove lid by pulling it sideways. The Slimsette™ Cassettes, a new generation in the Simport Tissue and Biopsy Cassette family. These cassettes are more compact and efficient than previous cassettes. They feature a unique recessed cover allowing more cassettes to be stacked in automated cassette labeling machines and increasing the number of cassettes that may be stored in storage cabinets. 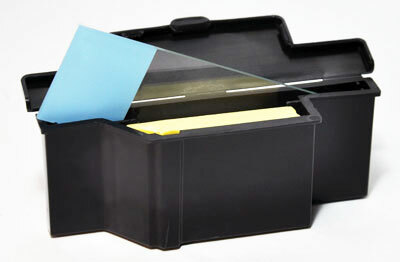 Slimsette™ Cassettes are molded from high density acetal resin polymer allowing them to sink rapidly. Acetyl resin polymer is compatible for use with histological reagents and solvents. The covers may be opened and closed repeatedly and always relock securely without specimen loss. The front labeling area has a 45° angle. 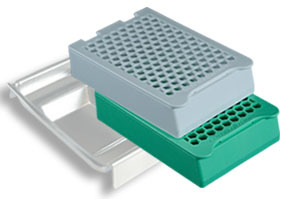 A biopsy processing and embedding cassette designed to securely hold biopsy specimens. Sold in dispenser boxes of 500 (1 case = 3 boxes) and in a case of 10 pre-filled sleeves of 75 cassettes for Thermo MicroWriter™ and PrintMate automated cassette labelers. 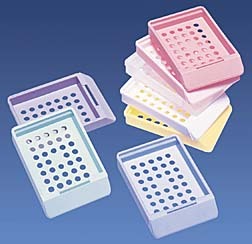 A tissue processing and embedding cassette designed to securely hold tissue specimens. Sold in dispenser boxes of 500 (1 case = 3 boxes). Will work in cassette labelers that print to a 45° print surface. Cassettes have 1676 square openings of 0.38mm allowing for greatly improved fluid exchange without having to use biopsy pads. Large anterior and posterior slots in both cassette and cover ensure that the Micromesh™ cassette will sink rapidly. 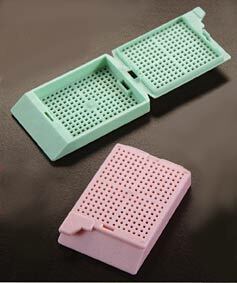 A large square compartment, 27mm, is perfect even for needle biopsies. The cover does not protrude above the cassette, a great space-saving feature allowing more cassettes to be stacked in automatic labeling machines and tissue processors. 45° angle writing area. Covers are pre-installed on cassettes. Sold in dispenser boxes of 250 or cases of 1000. Similar to # 27150. Compartments measure 13mm, cover and base have about 1676 openings of 0.38mm maximizing fluid exchange. 45° labelling area. Sold in dispenser boxes of 250 or cases of 1000. Cassette has 6 distinct compartments 7 x 12mm, numbered from 1-6. No biopsy pads necessary. Cover and base have over 3000 square openings of 0.26mm, 170 holes per compartment to maximize fluid exchange and proper draining. 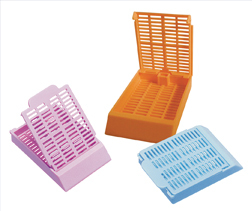 Disposable plastic tissue cassette bases are suitable for holding and identifying tissue samples in processing, embedding and sectioning procedures. The cassettes fit securely in microtome chuck adapters. 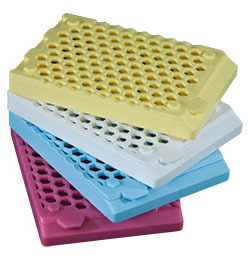 They are molded from a high density polymer that is totally resistant to the chemical action of histological solvents. The slanted writing surface accepts writing easily, permitting sample identification throughout all stages of embedding and long afterwards when archived. They are available in several colors. 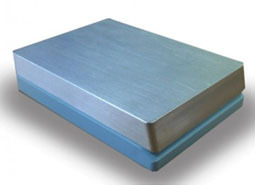 These cassettes are made to accept standard metal lids, Product No. 27167. Sold in dispenser boxes of 500 or cases of 1500. Stainless Steel lid for use in place of the plastic lid on Series 27168 Cassettes. Size: 28mm width (1.10"), 33.5mm length (1.35"). 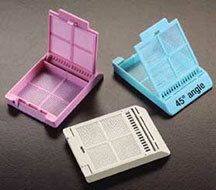 Embedding rings are suitable for holding and identifying tissue sample blocks and fit well in microtome chuck adapters. The etched writing surface on the ring is marked with an identification number and placed on top of the sample block. Additional paraffin is poured into the base mold to cement the ring onto the tissue block. The embedding ring securely holds the tissue sample in the microtome chuck adapter for sectioning and then identifies the sample while in storage. Embedding rings are available in white. Sold in boxes of 250 rings; one case is four boxes of 250 rings. Disposable cassette especially designed to hold larger specimens with a maximum thickness of 10mm during embedding and storage. 40.1 x 28.5 x 13mm H (1.58" x 1.12" x 0.51" H). Sold in dispenser boxes of 250. Covers assembled. Extra-large processing/embedding cassettes with covers. 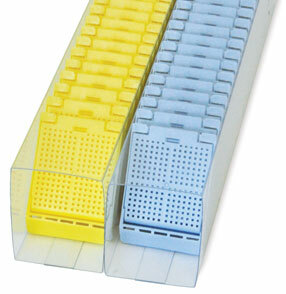 Disposable cassette designed to hold larger specimens with a maximum thickness of 12mm. Ideal for prostate, brain, breast tissue and eyes. Extremely useful for research and toxicology laboratories. The new “Hex” pores hold the large tissue specimens to the cassette much more securely than traditional slot design. With an internal cavity a third of the depth of the conventional Super Mega, the Super Mega Mother Ship provides an innovative solution for the processing and embedding of large tissue specimens. Using this cassette helps meet recommendations for HER2 testing in the UK and ASCO/CAP in the USA. By reducing specimen thickness (5mm or less), processing time is shortened while ensuring high quality tissue processing. The Super Mega Mother Ship cassette uses an innovative permanent docking bay for a standard tissue processing cassette printed with ID barcodes and/or test information. This enables the specimen to be entered onto a LIMS guaranteeing its accurate and reliable tracking. 100 printable cassettes are provided with each box of 100 Super Mega Mothership Cassettes. Casting can be done in 30 minutes at -8°C. Available in 7 colors. Extra-large processing/embedding cassettes with covers. 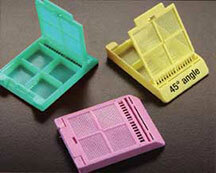 Disposable cassette designed to hold larger specimens with a maximum thickness of 5mm. Ideal for prostate, brain, breast tissue and eyes. Extremely useful for research and toxicology laboratories. Optimal for large specimens grossed at 5mm thickness for improved fixation and tissue processing. The Super Mega Slim Cassette Spacer Bar is to be used with the Super Mega Slim Cassette when sectioning. 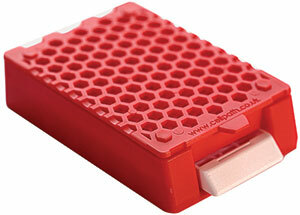 The adapter bar fits the back side of an embedded Super Mega Slim paraffin block. When pre-chilled, the spacer bar will also provide additional cooling to the block during sectioning. 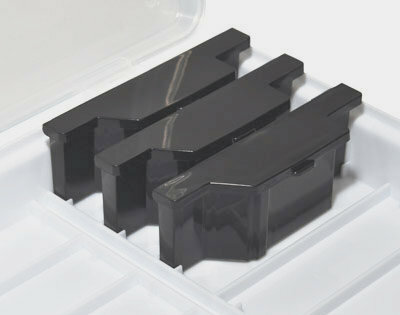 Incorporating an intuitive quick-release system, the clamp can securely hold any tissue processing cassette from the Super Mega series of cassettes. 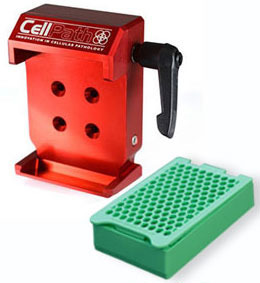 The CellSafe™ is designed to contain small tissue fragments and biopsies during tissue processing. The CellSafe™ 5 was developed for the simultaneous preparation of core biopsies, ideal for breast and prostate specimens. Each well is numbered for identification. The blue cassette aids contrast and visualization of light colored biopsies, normally experienced with breast tissue. The acetyl resin frame and nylon mesh are suitable for use in common tissue processing reagents including Formaldehyde solutions, Bouin's Fluid, Alcohol solutions, Xylene, Chloroform, Citrus based clearing agents and Paraffin wax (melting point up to 65°C). If you are using any unusual reagents it is suggested that you carry out preliminary chemical compatibility tests before using the CellSafe™ 5 to contain tissue samples. The CellSafe™ + Biopsy Capsule is designed to contain small tissue fragments and biopsies during tissue processing. The blue CellSafe™ + Biopsy Capsule makes it easier to see small pieces of tissue contrasting with the blue mesh screen. 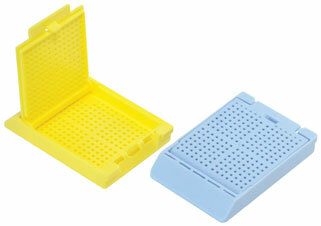 The CellSafe™ + Biopsy Capsule with a hinged cover fits into a regular cassette. Top and bottom consist of extra fine nylon mesh, 200 x 200 micron mesh screen, preventing small tissues from getting lost during specimen preparation, keeping them safe. 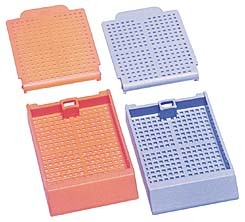 The plastic frame and nylon mesh are suitable for use in common tissue processing reagents including formaldehyde solutions, Bouin's fluid, alcohol solutions, xylene, chloroform, citrus-based clearing agents and paraffin wax (melting point up to 65°C). 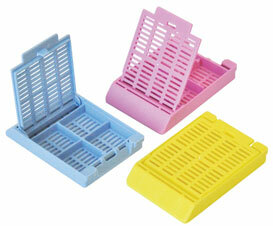 The plastic frame is made from the same material widely used in the manufacture of plastic processing cassettes. If you are using any unusual reagents it is suggested that you carry out preliminary chemical compatibility tests before using the CellSafe™ + Biopsy Capsule to contain tissue samples. The CellSafe™ + Biopsy Capsule is designed for single use only. Interior dimensions of a regular cassette are: 30 x 26 x 4.92mm H.
Exterior dimensions of the CellSafe™ + Biopsy Capsule are: 27.5 x 25 x 4.57mm H.
Biopsy Foam Sponge Pads prevent tissues from being lost during processing. Made of cellular polyester urethane foam which is always verified for consistency throughout in order to achieve optimum solvent flow. 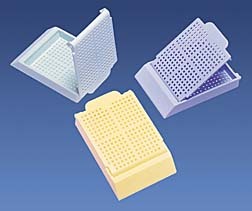 Biopsy samples are sandwiched between two foam pads and are placed in tissue cassettes/capsules with metal or plastic lids. Packed 1000 per bag. 1 Case is 10 packages of 1000. 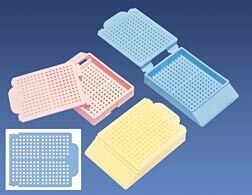 These nylon biopsy bags are made for the processing of small pathology tissue samples and cytology aspirates. Tissue samples are placed or filtered into the biopsy bag. The bag is then placed into a tissue cassette and processed as normal. 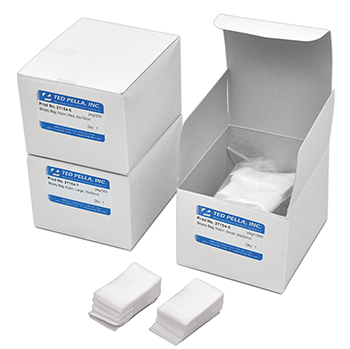 These nylon biopsy bags prevent the loss of small tissue samples. Available in three sizes. 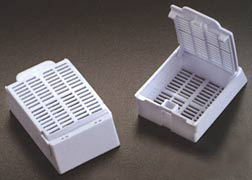 The Slide-Sette Saver offers a convenient single container for shipping a paraffin tissue block together with its corresponding slide. 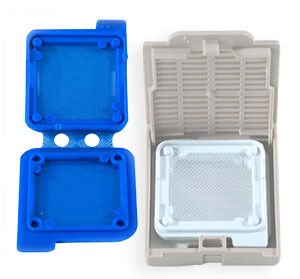 The sturdy molded polypropylene container nestles the paraffin tissue block securely while offering a safe residence for its companion slide. 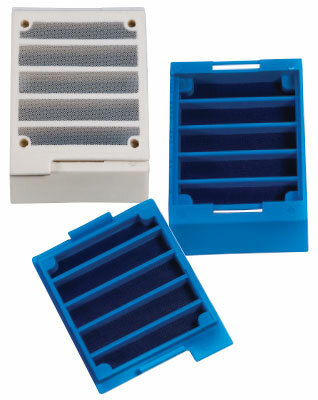 The Slide-Sette Saver provides a protective storage environment for both block and slide in one unit and safely eliminates lost or separated patient samples. Available in natural or black. Dimensions: 28mm deep or tall x 79mm wide x 17mm thick at the center. 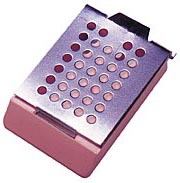 It holds one slide and one standard size cassette paraffin block. 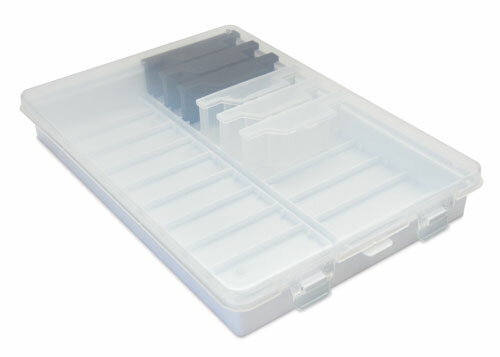 The Slide-Sette Saver Storage Box offers an organized, long-term storage system. 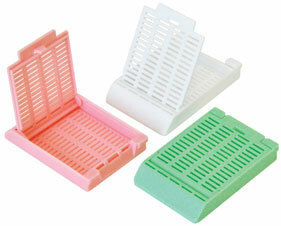 The storage box will hold 20 Slide-Sette Savers and is available in natural. 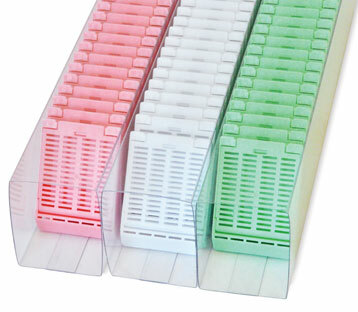 Slide-Sette Saver Storage Boxes are stackable. boxes are sturdy and stackable. 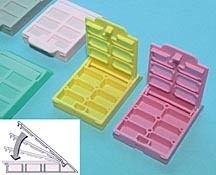 Slide-Sette Savers fit securely inside rows of storage box.